While I like cooking, and am willing to spend a decent amount of time doing it, I do like it when things are pretty easy and simple to put together. Especially when we don’t have a lot of time. This recipe was intriguing because of just that – it was something that might normally take a long time to make, but in a quicker version. You can read the recipe here. Now, I will agree that this can be made on a “weeknight” (since I did that) but it still takes a decent amount of time. Which means either you have to start early or dinner gets pushed back. It probably took me an hour and a half to make this last Tuesday and that is after doing some prep in the morning. You see, I knew it was still going to take awhile and if there was anything I could do to not go crazy in the evening, I needed to try it. In the end, I made the prosciutto and vegetables mix in the morning. It threw the morning off a bit but I felt that it was worth it. The only change I made was to use a little less prosciutto that called for. I had bought a package that I thought had enough in it for two recipes but it was so I had to cut back on each one to make it work. I did my best to follow the directions and the timing on this recipe. I did have a little trouble where the sauce did a lot more than just “turn dark” or have some “brown bits” on the bottom. It flat out burnt and inspent a little time trying to scrape the bottom so we didn’t wind up with burnt chuncks in the sauce. That delayed the recipe but only by about 5 minutes. Overall, this turned out very well despite taking a bit longer than I had hoped for a “weeknight” recipe. However the alternative was spending several hours making the sauce so I think maybe it worked out okay. Plus it tasted good. 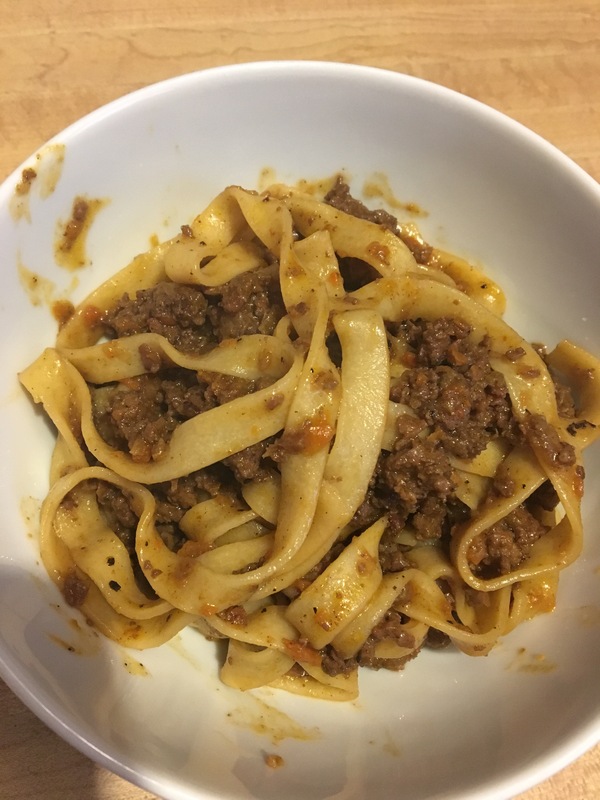 This entry was posted in Pasta and tagged bolognese, cooks illustrated, noodles, pasta, sauce, tagliatelle, weeknight pasta. Bookmark the permalink. I’m obsessed with pasta! I often will just order a classic bolognese if I go to an Italian restaurant.